Shadows On My Wall is published by Schiffer Publishing. The street lights make shadows on Kevin's wall! In those shadows, he sees monsters, dragons, and all sorts of frightening creatures. Does he let them scare him or does he find imaginative ways of dealing with these creepy shadows? Find out in this frightfully fun book. Through 15 creative illustrations of silhouetted shadow characters, contrasting with night-time colors, Kevin's room and his imagination come to life! Illustrations also show how you can create your own shadow figures! From Kevin's experience, children will learn how to deal with their own shadowy fears. 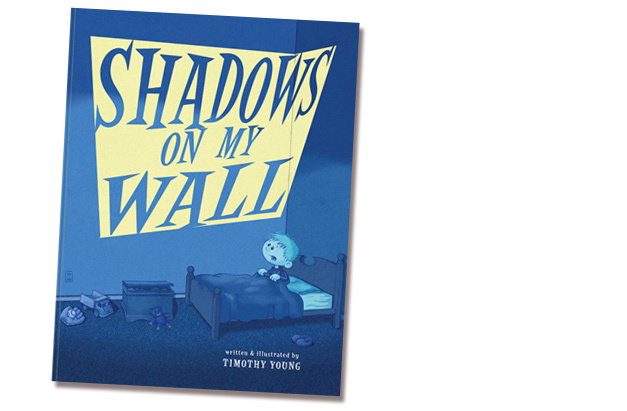 Read about the the creation of Shadows On My Wall on Timothy Young's blog.